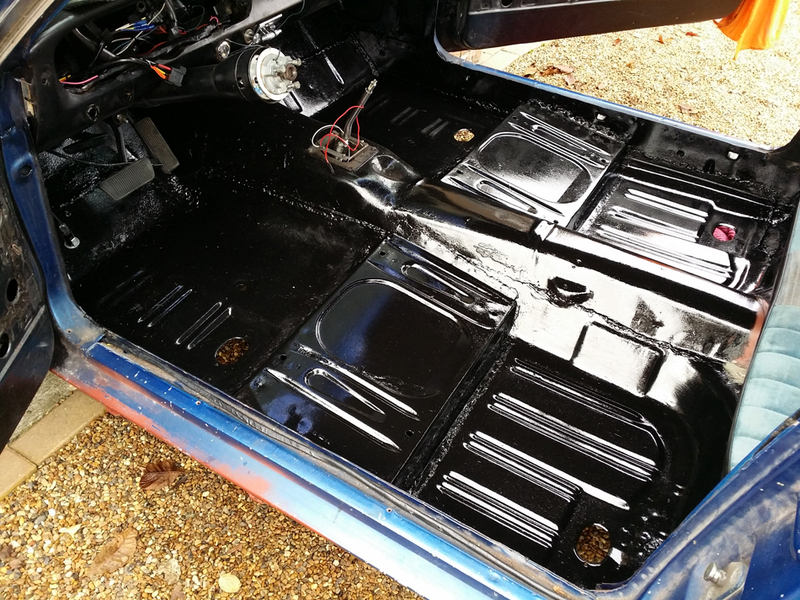 The floor pan was replaced before I purchased the car, that was part of a restoration I didn’t fancy doing to be fair. But knowing what I know now and the help I have had from friends and professionals, maybe I would have had a go at it. The underside of the car has been under-seal sprayed, while the inside has been wax sprayed. The welding of the floor pan is not the best or neatest I have seen and this raised a little suspicion on my behalf knowing what some of these “restoration experts” get up to. I removed a fair bit of the filler around the welds and the filler was there to patch up the uneven welding and the grinding, so it was not to much of an issue apart from cosmetics. There was however a patch of larger filler right in the corners that I wanted to investigate. I revealed a little patch of horrors and cover up of some rust sections. I removed virtually all the filler from the area to expose the welding and down to the bare solid rust that also got some treatment with a wire brush. Lucky enough it was all solid enough but had just been covered over and not treated, done in a hurry I expect. 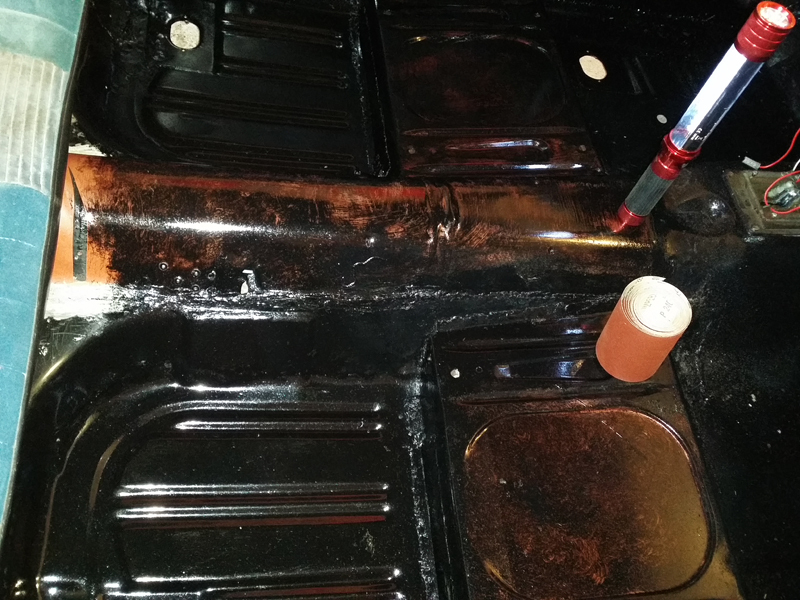 I have used POR15 to treat the floor pan at the front so far to treat the hidden rust and to prevent any further rust spots. I will not be going through the whole application process as I have explained that fully in my POR15 review, click here for that review & process quick link on how you apply POR15. This set of photo’s is to show what I have done so far with a little explanation for the photos to go with it. The floor pan is such a large area I had to tackle it in three sections. The front, where the pedals are, the middle under and behind the front seats, then the section under the rear seats. To remove the old grease and Waxoyl I have used bits of the old carpet and cut into rectangles sort of five by seven inches or so. The carpet is nylon and slightly abrasive, it’s fairly stiff and your fingers won’t go through it. It’s absorbent and I have lots of it! The carpet is softer than sandpaper, wont clog up as quickly etc etc. I really like the idea. I have taken a couple of photo’s of the before and after of the carpet. Section 1 – The front foot wells. Remove the old carpet and clean up any loose material and remove any loose surface rust. Next clean the area with the POR Marine Clean to degrease and remove the waxed coating what there was of it, and any oil etc . Once the areas are degreased fully apply the Prep & Ready and leave on the metal for at least thirty to sixty minutes making sure that the metal to be treated stays wet at all times. Rinse of the Prep & Ready with clean water and allow to dry thoroughly. The thing to remember is that POR15 is activated by the rust, so a little rust is a good thing for it start the cure process so don’t remove it all. The surface must be bone dry before applying the first coat of POR15 paint. Apply a second coat when paint is almost dry or a slight drag on the finger. If allowed to dry like I did, then 300g sand paper should be used to key in the second coat. You must always use two to three coats of the POR15. Remove the seats via the four holes on the underside of the car and that is all that holds the seat in place. Lift out the seat and remove the carpet to expose the rest of the floor pan. Exactly the same principle again is to remove the old loose and brittle material where you can. I have dragged my finger down the wax on the left side and in some other places you can hardly feel it at all, not a good job. I removed the old filler that was covering the welding to check the state of the metal. Where I found rust it was exposed down to the bare more solid rust in order for the POR15 to work. Once all the loose material and the filler was removed then degrease thoroughly with the Marine Clean. 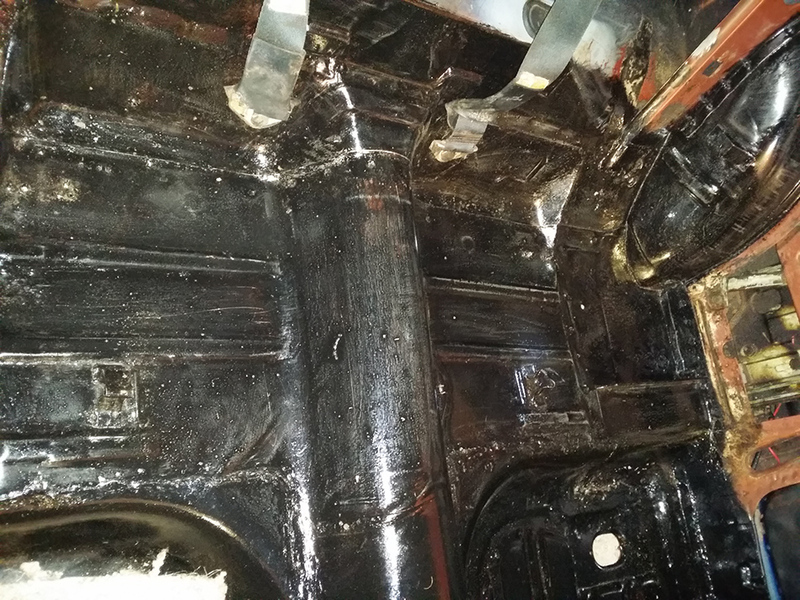 Once all loose material has been degreased and the rust was exposed, apply the Prep & Ready to the whole area and leave for at least thirty to sixty minutes. Rinse with clean water and allow to dry thoroughly. Then apply the first coat of POR15. I also light sanded the area to give a good key for the paint and then removed the rust. Either allow the POR15 to almost dry (tested by a finger drag on the paint) then apply a second coat, or allow to dry fully and 300g sand paper the first coat in order to key in the second coat. I have marked up a close up of the right side rust that was treated and then a close up of the left side. (POR15 is activated by rust so it’s important not to remove all the rust.) Trying to take a picture of the black paint the camera struggles a little but you can still see the area that was treated. Remove the back of the seat by lifting upwards and remove from the car. Remove the seat by lifting at the front and remove from the car. This will now leave exposed right into the back of the trunk area. Once the seat were out-of-the-way you can remove the side panels and gain access to the seat belt bolts. The same process was again to remove the dirt and grime, degrease, de-rust and paint. I spent five hours on a single side today and that was on the right (passenger) side. It was hard work, my arms are aching but at least I got a fair bit done. I knew this sections was going to be bad because of the thickness of the wax spray or what ever they had used. Marine Clean was mixed up as strong as I could go which is 1:1 mix. I sprayed the area and got to work, the rags were doing little and I had an idea. The old carpet is quite abrasive so I cut a section out and used that to act like a gentle wire wool pad if you like but this was nylon/ wool mix. It works brilliantly and I will be using it again. It agitates the wax off and allows you cut through to the paint or metal work depending on the state of it. There is however a lot of thick factory (I think) paint which was pealing and not doing a lot so I decided to remove that. This time I used my Snap On gasket scraper and being able to scrape the worse bits of was a major bonus. But, it was hard work. I managed to fill a complete desert carton up with just the debris I loosened up. The side rear quarter window section has a metal side panel in place and lifts up to expose the inner workings of the window winding mechanism. There was felt stuck to glue which was not holding anything in particular. So I decided to remove the dried glue and filler (factory still soft paste) that was between the seams. It had come away in most places so I removed that as well. After a quick clean and dry up I cleaned again so far this is the result. It obviously will need a final clean before the de-rust treatment but I will do that when I have completed the left side first. You can clearly see the difference between the two sides in the last photo. The left side follows exactly the same principles but I started the scrapping first to get rid of the worst grime with the Snap On gasket cleaner. Once the worst was off then I tried the Marine Clean which seemed to work better than the other way round I did it on the right hand side. The cleaner was rubbed in and scrapped the more difficult parts and then wiped up. The mastic/filler again factory by the looks of it was removed from the door pillar post. once that was off degreased again on both sides. while the POR Metal Ready was working I took some 280g sand paper to the surface and rubbed away the finer parts and to also give a key to the paint. Keeping the surface wet for forty-five minutes looked to be enough and washed it all down with water and dried with a towel. Then again a second cleaner towel. (old towels, t-shirts etc no longer required.) The metal will be left to dry overnight. The first coat of POR15 Rust Paint was applied today and took a total of three hours as I had a bit more of a clean up first. The area was dry and managed to use up two brushes that promptly went in the bin. The second coat should be a lot easier tomorrow. The first coat has had plenty of time to dry and the part is the sanding down with 240g for a good key for the second coat. most of the white you can see on the black paint is dust and wiped of cleanly. The second coat always goes on a lot smoother and used less of it as well. The results are instant and certainly makes a good show case of the floor. I made sure I went over the welded seams to give them a good protection with a third coat as it were. Thanks for the details. I have 1965 ford thunderbird that has tons of surface rust, waxy coating and adhesive that was revealed when the soggy carpet was removed. I too am considering the POR-15. Still need to pull seats and then get started. I was being overly ambitious when I purchased the car as first looks I assumed get her started then come drive daily. Well working on both at the same time.. Ideally running first and then tackling interior flooring and trunk area. Again thanks for getting me pointed in the right direction. Best success with your restoration. Hi Carlos, thanks for the comments and like you I had to learn pretty quickly. With the POR15 make sure you follow the directions to the letter. A good tip for you, place a thin layer of plastic or cling film under the lid to stop it sealing itself shut If you have any left over. I would love to see pics of your progress and all the best with your project too.